Prescott Air Conditioning & Heating discusses six signs that suggest it might be time to replace your air conditioning unit. Many folks wonder what to look for to determine how much longer their air conditioning unit will last. You definitely don’t want to have to replace your unit in the middle of summer. Prescott Air Conditioning & Heating explains discusses six things to look for when considering replacing your air conditioning unit. Air conditioner is older than 10 years. Generally speaking, your air conditioning unit should last for approximately 15 years. However, if you are facing an expensive repair or your home is just not cooling down, it might save you money in the long run to just replace the unit now. New units are much more efficient and should lower your electric bill. Air conditioner is insufficient. What is your SEER rating? The SEER measures air conditioning efficiency. A higher SEER rating means greater energy efficiency. Currently, new units must have a SEER rating of 13 or higher. If your rating is below 13, you can cut down on your energy costs by replacing your old unit with a newer more efficient model. Breaks down frequently. 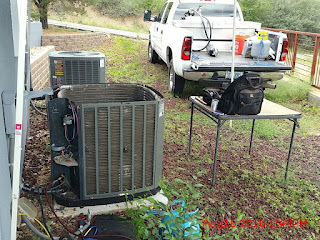 If you are calling us every year for another repair on your older air conditioning unit, you might want to consider the long term cost by not replacing it now. Some older units are known to become a “money pit” for their owners. Call us today to get our opinion of your unit. Uses R 22 Freon. Freon is being phased out by the United States Government. If your system still uses Freon you are going to notice that those repairs bills climbing in price. You will eventually have to replace the system anyway, so it would make sense to consider upgrading now to a system that uses R410A, the new refrigerant. Your home won’t cool down. If you can’t get your home to the temperature you desire, you might be experiencing the last years of your air conditioning unit. It is working extra hard and still unable to get to your desired temperature. This is a sure sign that something is wrong. It needs an expensive repair. If we determine that you need a really pricey repair that is 50% of the cost of a new unit, we might recommend just spending the extra money now and replacing your older unit…which should save you money in the long run. Concerned about your air conditioning unit? Schedule an appointment with Rich & Brenda, Air Conditioning specialists from Prescott Air Conditioning & Heating today. Call 928-308-1254. Other appointment times available! Call or send a message, we will contact you ASAP. Prescott Air Conditioning & Heating Repair 5 out of 5 based on 8 ratings. 5 out of 5 stars Catherine V Thank you for your excellent service! On a cold winter morning, we discovered that our heater was broken. You returned our call very quickly and came out to fix our furnace very quickly. Thank you! We have tropical birds and need to keep our house warm for them as well as ourselves. You are professional and prompt and your work is excellent. Thank you for your service! You may use this testimonial however you please. 5 out of 5 stars Jodi P. Rich and Brenda showed up within an hour of us contacting them, assessed the problem with our furnace, had the broken part on hand (!!! It's a 26 year old furnace!!!). They were extremely friendly, professional, explanatory and obviously care about the work they do. We had quite a few problems, and the 2 other HVAC folks said "just replace the thing" and took a service fee. While Rich tended to agree that it needs replacing, he made sure he got the unit working, inspected and was confident in its safety as a stop gap. Could not recommend them more. It's quite rare to get such thorough, professional. 5 out of 5 stars Lt. Major Leonardo L. Prescott, AZ Best service I have ever received. Rich and his wife arrived at our residence in a timely manner, very nice people. Rich explained in detail our issue with our AC system and how it occurred. He fixed my problem and provided some tips to keep our system up to par. The best part of the whole thing, they cared about their customers and it showed. You can trust that they will give you an honest quote and do what they can to fix your problem without taking you to the bank. Thank You Prescott Air Conditioning & Heating! 5 out of 5 stars Ian O. Prescott, AZ Brenda and Rich were very helpful. I called and left a message at 10 am on a Saturday, they called back an hour later, and we had our ac up and running by noon that day. Fast, friendly, easy to schedule and reasonably priced. As a local in Prescott I highly recommend them.